Our cover story this week was about a petition to change how fee levy groups at Concordia are funded. 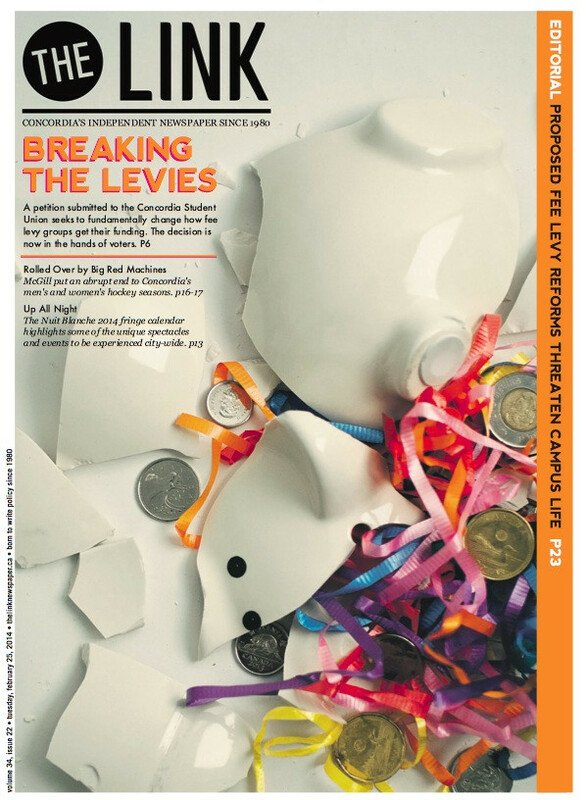 The creative team went over a host of ideas on how to illustrate this, but the smashed piggy bank won as a way of conveying the reform’s potential impact on fee levies and the small amount of money each student would save by opting out of six of these groups. It was only after we reached that decision that we discovered how difficult it is to find a pig-shaped piggy bank. We sent our graphics editor to about five different stores before he found one for $17 that came with a pink crown and tutu, but without a stopper. My heart was set on a still of the pig being smashed open by the hammer, but unfortunately it wasn’t in the stars. We managed to capture two good stills of the bank flying apart, but it doesn’t really look like a pig in either. Since that was the whole point, we settled for a careful arrangement of the broken pieces for the cover and a neat GIF to show the Internet we did the smashing ourselves.